There is currently just the 1 ferry route running between Orkney Islands and Shetland Islands operated by 1 ferry company – Northlink Ferries. The Kirkwall to Lerwick ferry crossing operates weekly with a scheduled sailing duration from about 7 hours 45 minutes. Whilst we’ve taken great care to ensure the information on this page is correct, as the frequency and duration of crossings on all routes can vary from time to time we’d advise that you get a live quote for current availability on this Orkney Islands Shetland Islands crossing between Kirkwall and Lerwick. The Orkney Islands are a Scottish archipelago approximately ten miles north of the mainland. They are mysterious islands, the largest of which is simply called ‘Mainland’, due to a millennia-old history embedded into the cultural heritage and landscape. The archipelago’s name dates back to the 1st Century BC, when the land was settled by Mesolithic and Neolithic tribes. Evidence of its past can be seen almost everywhere, with a large number of burial cairns, tombs, brochs and castles scattered across the vast green plains. The abundant wildlife attracts a great number of visitors, too, with a variety of rare bird and mammal species like puffins, seals and Eurasian otter to be found throughout the islands. Given the Orkney’s location between the two, the Shetland Islands, to the north, and the Scottish mainland, to the south, are within easy reach by ferry. Mainland has a couple of ports offering regular routes operated by the region’s leading ferry companies. 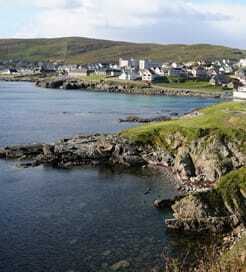 Shetland encompasses over a hundred islands to the north of Scotland, forming a subarctic archipelago in the North Sea. Britain’s northernmost point; where Scandinavia meets Scotland, the Shetland Islands captivate visitors with their unique heritage, striking coastlines and beguiling countryside. While the human population is warm and friendly, the animals inhabiting these shores are just as memorable, ranging from puffins and dolphins to the famous namesake pony. They also have plenty to keep history-lovers occupied, with numerous well-preserved archaeological sites. 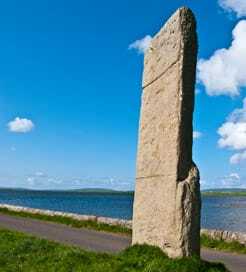 Many have been dated further back than the Vikings, who left their mark on everything from place names to local dialects, including Iron Age brochs and mystical standing stones. Ferries make the overnight journey from Aberdeen, on the east coast of Scotland, seven times a week, while there are less frequent, but shorter, routes available from the Orkney Islands, an archipelago to the southwest of Shetland.